With permission from Mr Subliminal of Las Vegas I have reproduced and edited a comparison of trading and poker that he recently wrote. Zero sum game (ignores commissions and assumes futures). Zero sum game (ignores rake). At any time, a trader may elect to stay out of the market at no cost. (software and DSL costs are assumed to be running expenses.) At any time a player may elect to stay out of a hand at no cost. (Blinds and antes are assumed to be running expenses.) Alternatively, the player may elect to leave the table. Information may be gleaned about the opponents. Information may be gleaned about the other players. Opponents and their numbers are unknown. Opponents and their numbers are known. Once a trade is initiated, a trader can do nothing more to influence the outcome of that particular trade. A player, because of the betting structure, may influence the actions of other players and hence the outcome of the hand. A trade, once initiated, may be closed out at any time only by the trader. 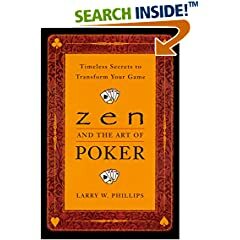 A hand of poker, once initiated, may be prematurely completed by the action of the player e.g. he folds, or by the action of others e.g. everyone else folds. A trade does not have a predefined length of time. A hand of poker has a fixed, predefined length (of time). A trade may be "prematurely" closed for either a profit or loss by the trader. A player can only prematurely complete a hand for a loss. At all times during a trade, the P&L is uniquely and unambiguously defined. At all times during a hand, the player's equity in the pot can only be subjectively estimated using incomplete information (in most instances). As a corollary to the above, the intra-trade equity curve is generally smooth and continuous. The intra-hand equity curve is jumpy and discrete. A trader will rarely see profits snatched away from him suddenly; his pain is of a more gradually built-up nature. A player will encounter many "bad beats" with their accompanying psychological pain. A trader may predefine profit target and stop loss. A player will have different losses and profits depending on the particular hand. In fact optimal play negates the notion of a stop loss.